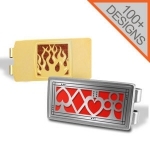 Shop the most unique money clips - make your gift a standout with cool customized money clip designs for every interest! SSelect from over 500 custom money clip designs, 30 colors, and silver or gold finishes to create awesome engraved money clip gifts. Each one is crafted with the thematic image that best expresses your personal style. 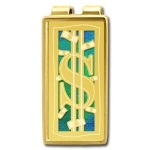 These unique money clips feature Kyle's strikingly original designs and a wide variety of styles. 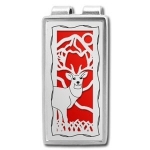 Optionally engrave to create truly special gifts for men or women who use cash or travel often. Great for keeping tip money and small bills handy, too. Made in USA. Unique, customized money clips with strong spring clip keeps cash and cards tight. Our designer men's money clip styles and pocket knifes all make great groomsmen gifts. 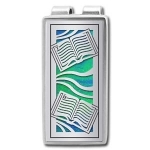 We have money clips in popular antique and contemporary designs - nautical, golf, poker, medical symbol, jet, dragon, southwest, Art Deco money clips and more for both men and women. 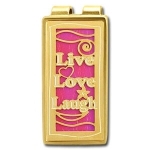 When shopping for people who are hard to buy for, stop by Kyle Design to find unique personalized money clips in a variety of stunning shapes and styles. 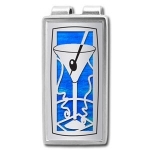 A must buy for the man or woman who resorts to paper clips for holding their bills, our custom clips are incredibly stylish in your choice of silver or gold metal finishes, vibrant shimmery or aluminum accent colors and distinctive designs that show off your personality. 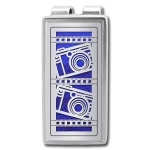 hop for cool money clips that showcase your interests. Money clips are an incredibly useful gift item for those who travel for business or pleasure, or who enjoy eating out often. If you like to keep small bills handy for tipping taxi cab drivers, hotel doormen or waitstaff at restaurants, these handy clips can conveniently organize your cash with ease. Nobody wants to be fumbling for a couple of dollars when there are others waiting for your table or taxi. No one wants the doorman held up and waiting for you to pull out your wallet when others need assistance. As many of us well know, it can be so easy for loose bills to fall out of a pocket unnoticed when they're hastily stuffed in for quick grab and go access. Practical and enjoyable for everyday use, a cool money clip will definitely keep you organized and ready for the next time you need to hand out a couple of bucks. For a money clip that's as fashionable as it is functional, take a look at Kyle's designer money clip collection in a wide range of great styles to suit every taste. View art & music money clips to find some of our most popular sellers adorned with contemporary arts designs - you can't go wrong with craftsman, mission period style and celtic knot patterns that are perfect for architects, people with an artistic eye and fans of all things decorative. If you're looking specifically for vintage styles, don't miss our cool Fleur De Lis, Art Deco and classic victorian accessories. 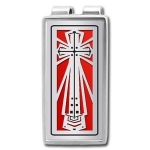 We also have a nice selection of theme money clips with unique symbols and characters that even the most difficult-to-please gift recipient will love. 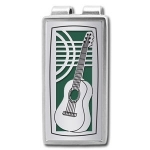 To design an accessory that is truly personalized to you, check out our custom money clips for a creative gift that reflects your personality and interests. For the devoted animals and pets lover, we have unique animal money clips in fun wildlife, pet, fish, bird, insect and fantasy creature designs to surprise any pet owner, breeder or groomer. 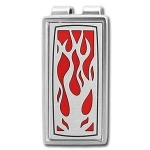 If you're struggling with the perfect congratulations present for a recent college graduate, leadership in the work place or volunteer recognition gifts, consider a professional money clip featuring a symbol of your chosen profession or trade, be it doctor, hair stylist, mechanical engineer, contractor or member of the military. Should food be your forte, click food & drink money clips for a fun wallet alternative that's ideal for a dinner date out, keeping track of your beer tab at a bar or holding coupons when you make a quick grocery run. We also offer an elegant collection of luxury styles. 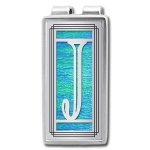 For the ultimate in personalization, design your own monogram initial money clip with silver or gold letter accents to symbolize your family name - a wonderful rite of passage idea that a father can give to his son for a milestone birthday or special occasion. 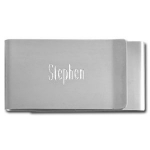 A monogrammed money clip can also be used to commemorate a special nickname or moniker, or given as a sentimental gift to honor the memory of a close friend, mentor or beloved pet. If a meaningful gift is what you're after, browse our custom engraved money clips that can be personalized with a sentimental message or greeting of your choice. Whether picking out a heartfelt gift for your spouse or a timeless Christmas present for dad, you can make it all the more special with an inspirational quote, popular message or inside joke inscription to make your loved one smile. Looking for an inexpensive but tasteful gift of appreciation for your employees? Check out our corporate logo engraving services so you can create your own elegant business logo gifts to be used as employee service awards, promotional presents for clients and office gift ideas for co-workers. Looking for the perfect gift for your husband, wife, mom or dad? 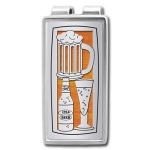 Make your gift-giving all the more fun with unique money holders for men and personalized money clips for women in a variety of original designs. 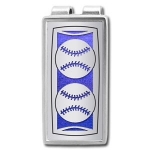 We have a wide assortment of cool sports money clips and pocket knives in baseball, basketball, football, rowing and swimming themes that any athlete or sporting fan will love. If you're not sure what style to get for a woman, try browsing our creative selection of pretty flower money clips for ladies, adorned with beautiful iris flowers for mom, tree of life patterns for grandma, sunflower imagery for a friend and daisy flower designs for a daughter. Can't decide on a gift for your upcoming 10th wedding anniversary, 50th birthday or 75 year milestone? 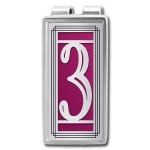 Let Kyle Design help you commemorate your achievements with special number money clips that are wonderful for birthdays and anniversaries. Our copper finish is popular for 7th anniversary presents while silver makes an ideal 25th anniversary gift. When celebrating a 50 year wedding anniversary, opt for classic gold. Whether shopping for yourself or a loved one, an exclusive gift from Kyle Design is sure to make your special gift-giving occasion all the more memorable. For a present that's guaranteed to impress, visit metal credit card wallets to design your own unique money holder gift set with coordinating wallets and travel cases.